My Gran used to make this for me, and it’s my favourite. 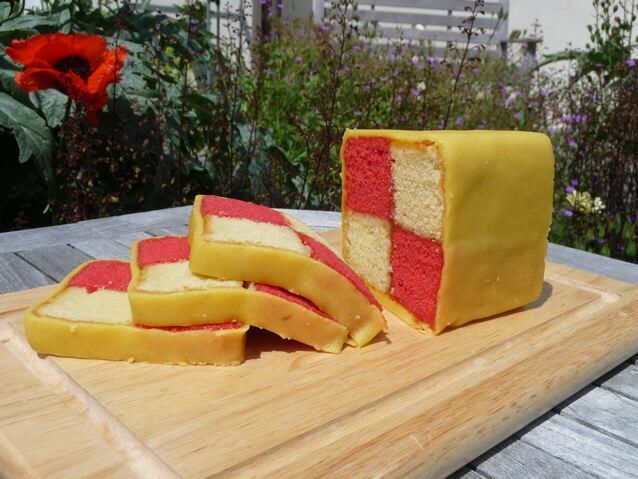 The origin of the name is not clear, but one theory claims that the cake was created in honour of the marriage in 1884 of Queen Victoria‘s granddaughter to Prince Louis of Battenberg, with the four squares representing the four Battenberg princes: Louis, Alexander, Henry and Francis Joseph. and I used these two Matfer tins that I had, one of which I got for a song in Cheltenham the other week. 25 cm long x 7 wide approx (the tin doesn’t need to be very deep) more like a couple of inches so you could use any two shallow tins. I got lucky this time. So now what I want to do is make a brown and green one, that red food colouring is just a bit much. Though if you close your eyes and eat the cake it is actually melty delicious, soft light sponge, and sweet with apricots and marzipan and home made is definitely better than anything you can buy. Assembling the thing has a certain lego like quality of silliness that made me feel very happy. Who can be sad looking at a cake like that? this sponge mix into chocolate and pistachio ???? Nothing complicated until you have to decide how much food colouring, don’t use as much as I did (!) and how to divide the batter between the two lightly greased tins. I cooked these at 170 C in an ordinary oven for 27 minutes, might take less or more depending on your oven. Felt soft and delicate when I pressed with finger but the skewer came out clean so took them out. Leave to sit in tin for a couple of minutes then turn out onto a wire rack and leave to cool completely before cutting each sponge in half into 2 square profiled logs with a serrated knife. You can cut away till you get them more or less the same and eat the bits as you go along. Assemble the cake from your four logs, white on pink, using warmed jam as the mortar on the inside surfaces, don’t put jam on the outside at this point. The logs don’t have to be perfect, the cake is quite forgiving as you assemble it. When putting the marzipan on, you need to roll it out quite thinly to about 1/4 inch deep. You need to do a bit of measuring to make sure you have a piece that will wrap all the way round the cake. Then you brush some warmed jam on the top of the cake Pick the cake up and place it jam side down on the marzipan sheet. Then cover the sides and the top with a layer of jam and gently bring the marzipan up round the sides, pressing and smoothing as you go and across the top. Trim off the ends with a sharp knife and turn upside down again so the seam is on the bottom of the cake. It’s a good idea to chill the whole thing in the fridge for an hour to help it firm up once you have put the marzipan on. what sort of chocolate/cocoa would I need to add and how much ? ditto if I chopped up pistachios and toasted them a bit, how much would I need to add? And if anyone wants to have a go at it and show me how it should be done, that would be great! If you send me a picture, (or if you blog, a link to your post that would be fun too) – and I’ll add them on to this post if you want me to. Edit: Since I wrote this post I have had a go at a chocolate version using Suelle’s suggestions of adding 1 tbsp of cocoa and 50 g of melted chocolate to one half of the mixture and 50 grams of ground pistachios and a smidgen of green food colour to the other half. Here’s a picture: I really like the chocolate marzipan which was 2 tbsps cocoa worked into a packet of white marzipan…. 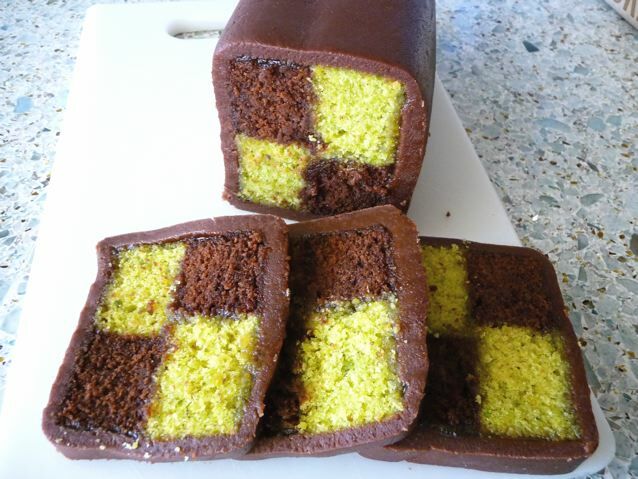 This entry was posted in Cakes, Recipes and tagged Battenburg cake, chocolate marzipan, chocolate pistachio battenburg cake, matfer tin on 20/06/2010 by Joanna. Heehee! You make it and send me the picture :) Though the ladybirds will taste very nasty, but beetroot might work, I know you like using that in cakes. I think they look very precisely done – the things you do for that boy of yours! These both look great – I love the bright pink marzipan! to get a real green colour. I would use green colouring and add about 50g of finely chopped pistachios for flavour. To the other half of the batter, sift in a tablespoon of cocoa and then gently fold in 50g melted plain chocolate. Chocolate and orange is another good battenburg combination, colouring white marzipan with kneaded-in cocoa. I was hoping you would make suggestions! Thanks so much, I’ll have a go next week Suelle :) I saw a lemon and pistachio cake in this month’s Waitrose magazine too, my cake list gets longer and longer…. Joanna I love that cake. Having never heard of it, seen it nor tasted it, I can still happily say I love it. It just makes you want to smile. One of the monkeys is having a birthday soon and I may just do it for him. Might have to practice a bit first though :-) How about a strawberry and coconut one? Thanks for posting my picture Joanna…mine were certainly rectangles rather than squares, but very well received. I baked in the base of 2 bread tins. I can remember calling this “window cake” as a child and peeling off the marzipan to eat at the end. I also have memories of little squares of cake individually wrapped in marzipan…cannot seem to find anything similar on google other than fondant fancies which seem to be fondant icing whereas I definitely remember marzipan. This cake has such strong childhood memories attached to it for me that I am almost too scared to suggest anything more sophisticated…but coconut and pineapple would seem a good combination and I am half thinking orange and lemon, using the Fiora di sicilia. 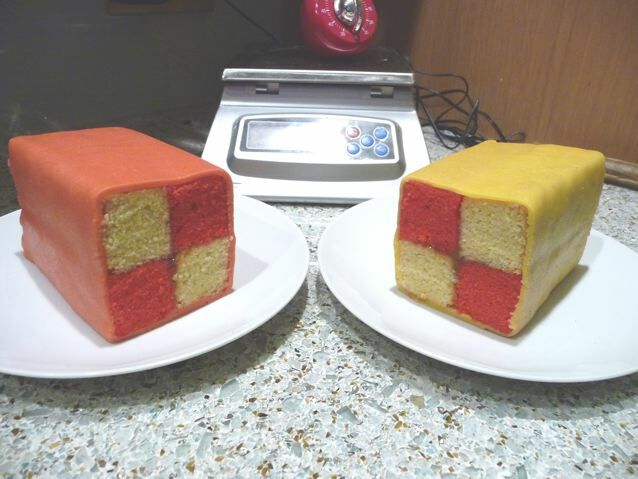 Maybe even a carrot cake alternating with an orange……..
Not at all, if anyone else wants to send me pictures and notes on their battenburg memories, I’ll make a a page for them separately…. in fact I’ll set one up now and put Lynne’s on there. You can email me at zebbakes at gmail.com. Written that way to make robot spam less likely but use the normal squiggle in the address where I wrote at. I’ve never seen or heard of this cake before. I showed it to the kids and they keep asking to “see the crazy cake again”. Hahaha. Might have to try it for them. I think it is definitely one for kids, or grown up kids, Dan! What fun, these look amazing. Not sure I could bring myself to eat them though as the colours look too good to be true! As for chocolate and pistachio, I would try substituting 25g of flour for cocoa and not use chocolate as that might make the sponge too heavy. But have just read Suelle’s comment and she certainly knows a thing or two about cakes, so I’d be inclined to follow her advise. I’m wondering if grinding up the pistachios would give more colour and more flavour? Choclette, I am never sure what the difference is between using chocolate and cocoa in cakes. I was going to try Suellle’s suggestions next time. Qahtan in Canada suggested adding something like part of a pistachio pudding mix, but I am not sure we have that here. I was going to ask you what brand of cocoa you use, as I have had various ones and they are very different in colour and smell and presumably in how they bake? Joanna, I always use G&B cocoa so don’t really know how different it would be using other brands. I use that because it’s organic (and used to be fair trade, don’t know if it still is since the big boys have taken it over). I’m going to the supermarket later, so I’ll gawp at the shelves to see if any ideas spring to mind for your chocolate and pistache recipe. By the way, I’ve used your lovely bakeware for a spelt & pumpkin seed sourdough tin loaf. Doesn’t it make perfect, smooth corners. Good tins those matfer ones, gives a nice narrow tall loaf, sort of European shape, I have been clipping balls this morning, two small ones and 1 big one done, three more big ones and a small one to go… I’m pacing myself, hope to get them all done by the weekend. It gets hard with Tony, Joanna. He doesn’t like rice (amongst other things). It’s difficult living with someone who’s not a foodie. Clipping balls. You mean topiary? How swanky, I always think a house with topiary is a thing of beauty, unless it’s sprouting out of shape. I then think, why do they do it if they cannot maintain it. Stay cool at the Lido today – looking forward to seeing the work too Gill! What a fun photo – a daguerrotype of you in box! love it! Don’t think for a minute that I have beaten you to it. I’ve done exactly two and a half so far and I am sure that you have many more than me! This is a photo from April so they hadn’t really got out of hand at this point. How many trees have you got? Your house could look like Hampton Court. Ah Hampton Court,…are we talking trees or box ? I love the deer park at Hampton Court, it really was my ‘back garden’ when I was growing up and there are some wonderful trees in there. Have you been to the 17th C Dutch water garden at Westbury on Severn? It’s beautiful. I will not deny that they are fiddly, but I think now that the secret maybe is to sandwich them together, wrap in foil, and then maybe chill for a bit before wrapping the marzipan round, I might have another go. Like a lot of these things once you cut the slices it all looks a lot tidier. I am sure there is something you can do to stop the crumbs getting everywhere, maybe do a thin first coat to stick them down. It is easier than doing a proper round cake with smooth icing and piping, those I dread and avoid wherever possible. Thanks for commenting Kari ! I’m very impressed by your cakes Joanna! Really pretty and perhaps fun to make if its not too frustrating. I think I’d like the chocolate/pistachio one. I’ve been thinking of trying a checkerboard type cookie at Christmas if I don’t chicken out. Very much like your Battenburgs as they’ve got associations with tea-time at much loved grandparents for my Best Beloved. You had an admirably tidy finish on yours that yet again emphasises to me just how much patience you have with these essential details.